Our lovely George V Memorial Garden is in need of some TLC!! Now that we have no park keeper, the council is only going to be cutting the grass during the year and tidying up the garden as and when it can. We desperately need keen gardeners - with or without experience - to help us return this little oasis of calm at the centre of the park to its former glory. Last year we formed a small but very effective gardening club that meets every Sunday morning from early spring to late autumn, working from around 10am to 1pm - although everyone is welcome for whatever amount of time they can spare. The sessions are sociable, fun and very rewarding. So far the group have cleared many of the overgrown flower beds and planted bulbs, bedding and perennial plants. Why not join them and make a real difference to the garden, for everyone to enjoy? All tools and equipment, including gardening gloves, are provided - or you can bring your own if you prefer - and we also provide light refreshments for tea breaks. 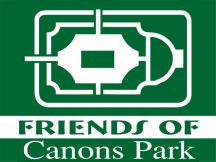 If you are interested in joining the group, please contact our gardening volunteer coordinator, Conchi Vera, at: canonspark@outlook.com for more information and session dates. ​We are also looking for corporate volunteer teams to help out with gardening in the spring and summer months, so please get in touch with Conchi if you would like to reserve a date. The sessions are fully supervised and refreshments are supplied.